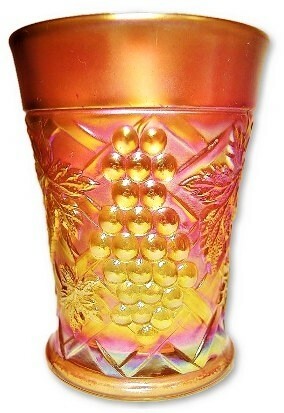 Fiery amethyst Acorn Burrs tumbler. Measuring 4 1/8" tall and 3 1/8" across the top. No chips, cracks or repairs. 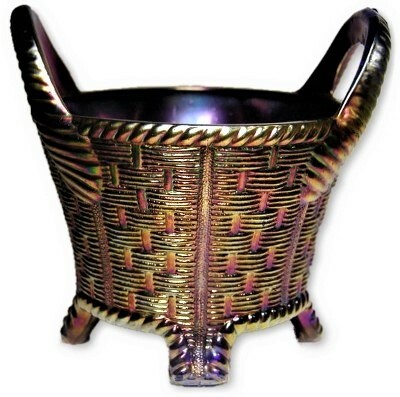 Amethyst Bushel Basket. The item measures 5" X 4 1/4". There are some in the making commonly found straw mark separations that tend to occur on the handles and rim of this Northwood shape. Marked with the underlined N in a circle mark. No chips, cracks or repairs. 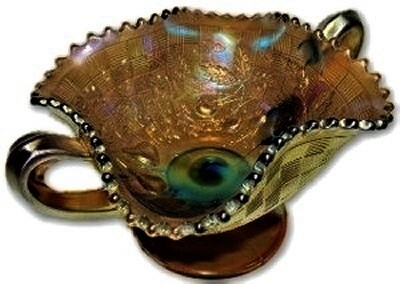 NORTHWOOD extremely rare "Aqua Opalescent & Uranium Reactive Glass" two handled "Bushel Basket. 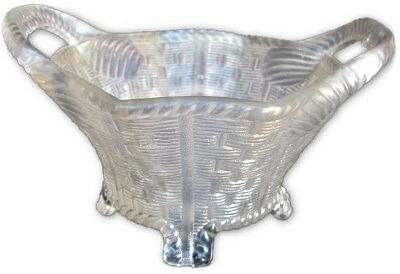 The rarity of an AO Bushel Basket can hardly be underestimated. 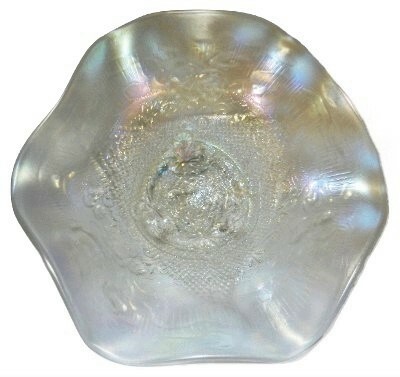 This is not Vaseline but instead an Aqua Opal that Glows at the lower section and the handles when held to a black light. Measures 5" X 4 3/4". No chips cracks or repairs. 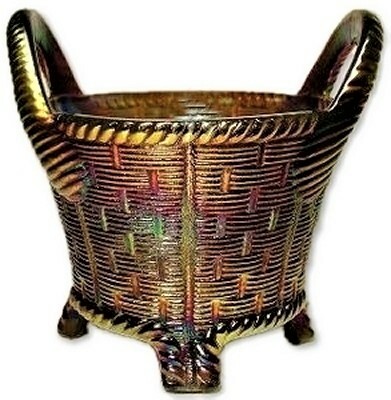 Excellent blue Bushel Basket. 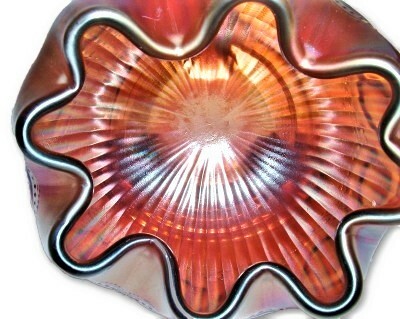 The item measures 5" X 4 1/4". There are some in the making commonly found straw mark separations that tend to occur on the handles and rim of this Northwood shape Marked with the underlined N in a circle mark. A couple of extremely tiny random flea bite sized pin prick flakes which you truly have to search to find. No chips, cracks or repairs. 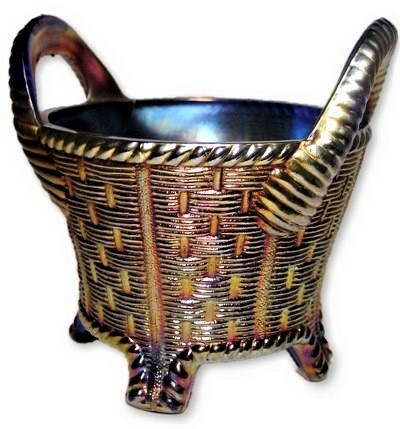 Cobalt blue Bushel Basket. The item measures 5" X 4 1/4". There are some in the making commonly found straw mark separations that tend to occur on the handles and rim of this Northwood shape. Marked with the underlined N in a circle mark. No chips, cracks or repairs. 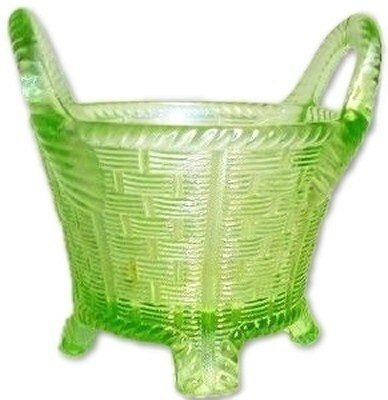 Northwood Lime ice green Bushel Basket. Measures 5" X 4 3/4". 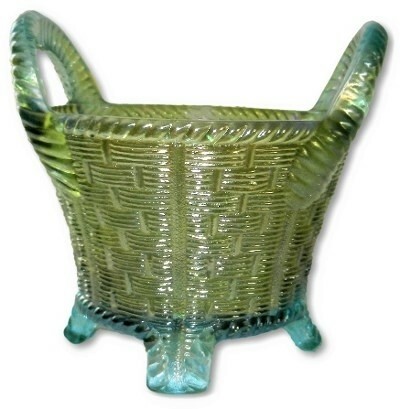 This nice frosty iridescent Northwood Bushel Basket has some interesting green glass threads within the glass and the normal straw marks found in the handles. The Northwood underlined capital N in a circle mark is in the interior bottom. There are two minuscule flea bites on two of the feet edges. No chips, cracks or repairs. 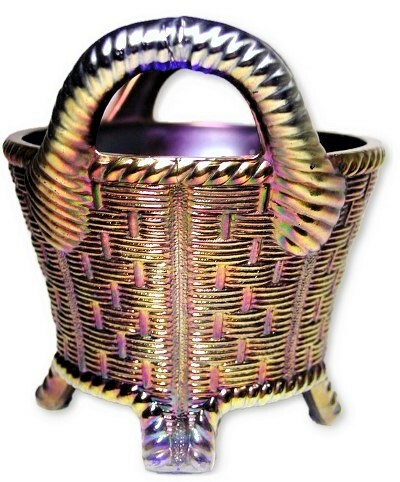 Horehound Bushel Basket with outstanding, color, and iridescent finish. This item is marked with NORTHWOOD's underlined capital N in a circle. Measures 5" X 4 1/2". No chips, cracks or repairs. 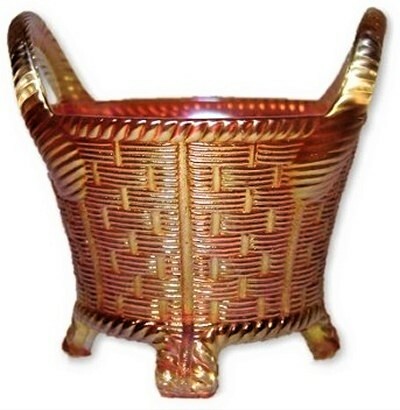 Marigold Bushel Basket. 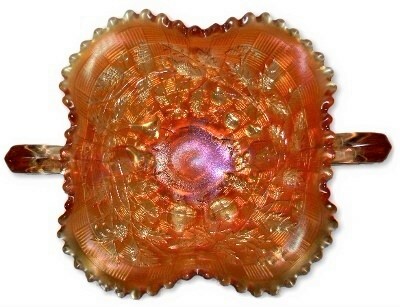 The item measures 5" X 4 1/2". 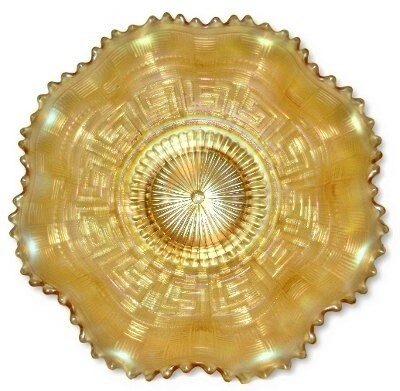 There are some in the making commonly found that tend to occur on the handles and rim of this Northwood shape. Marked with the underlined N in a circle mark. No chips, cracks or repairs. 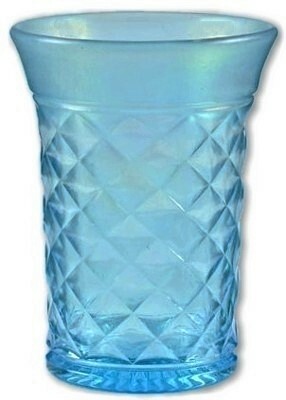 Concave Diamond pattern tumbler in frosty Celeste blue. Measures 4 1/2" X 3 1/8". No chips, cracks or repairs. 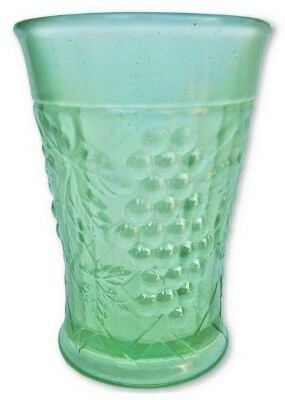 Ice green husk base Corn vase. 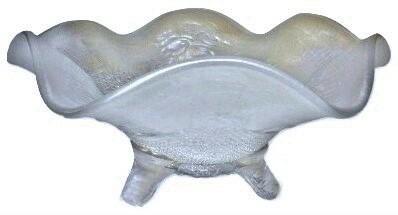 Soft frosty finish at the upper section highlights the great mold strike on this example. Marked with NORTHWOOD'S underlined capital N in a circle. Measures 6 1/2" tall, 3 1/4" across at the base and 2" across the top. No chips, cracks or repairs. 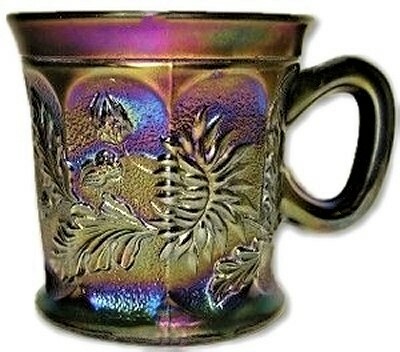 Electric purple Stippled Dandelion mug. Marked with NORTHWOOD's underlined capital N in a circle. 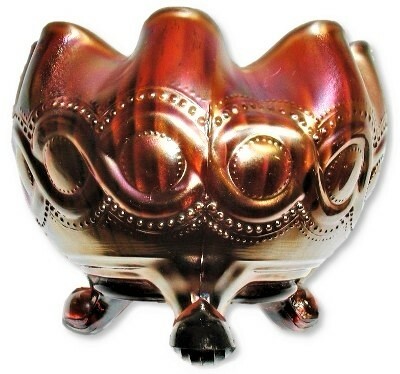 Measures 5" at the widest point and stands 3 1/2" tall. No chips, cracks or repairs. 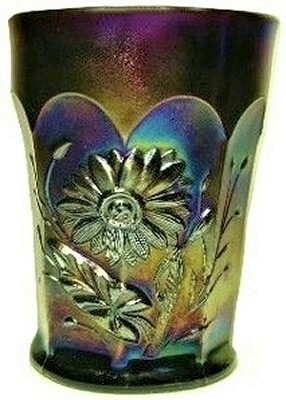 Brilliant black amethyst DANDELION tumbler. Marked with NORTHWOOD'S underlined capital N in a circle. No chips, cracks or repairs. 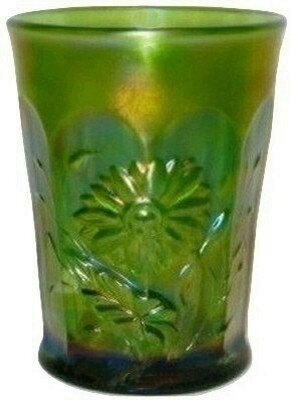 Stunning emerald green DANDELION tumbler. 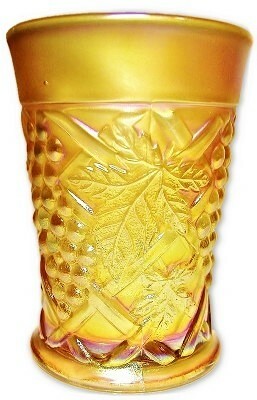 Marked with Northwood's underlined capital N in a circle inside the base of the tumbler. Measures 4 1/4" tall and 3" across the top. No chips, cracks or repairs. 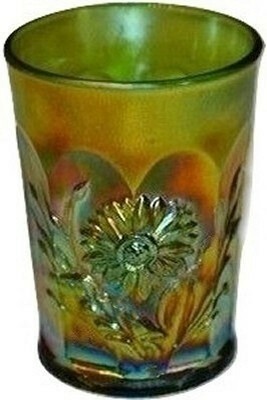 Green DANDELION tumbler. 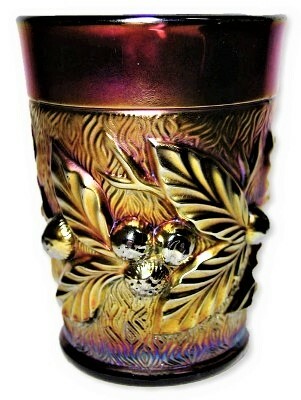 Marked with Northwood's underlined capital N in a circle inside the base of the tumbler. Measures 4 1/4" tall and 3" across the top. No chips, cracks or repairs. 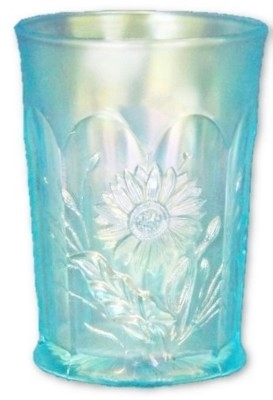 Ice blue DANDELION tumbler. Marked with NORTHWOOD'S underlined capital N in a circle. 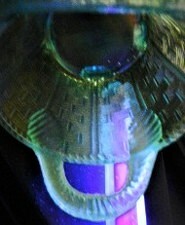 Very, rich, and frosty iridescent finish as well as an excellent mold strike. This item measures 4 1/4" X 3 1/8". No chips, cracks or repairs. 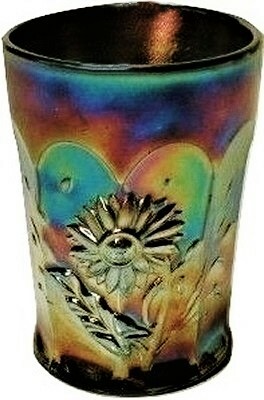 Dark purple DANDELION tumbler. Marked with NORTHWOOD'S underlined capital N in a circle. 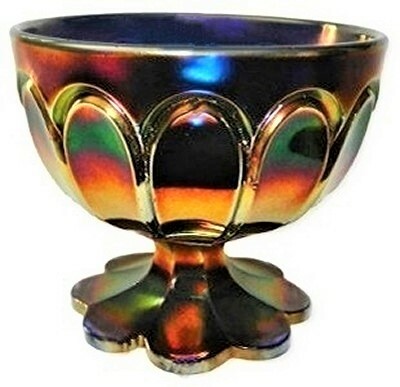 Very rich, dark iridescent finish as well as an excellent mold strike. This item measures 4 1/4" X 3 1/8". No chips, cracks or repairs. 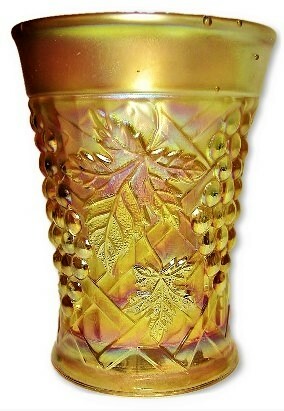 Northwood DIAMOND POINT pattern green vase. Marked with Northwood's underlined capital N in a circle. Stands 10 1/2" tall and the base measures 3 1/2" across. No chips, cracks or repairs. 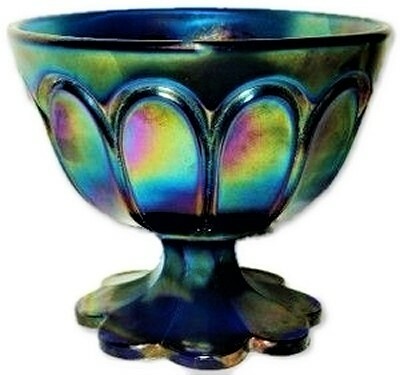 Blue DOUBLE LOOP pedestal chalice sugar bowl. The interior is marked faintly with NORTHWOOD'S underlined capital N in a circle, it only has minor, normal use wear underneath the pedestal foot, no chips, cracks or repairs. 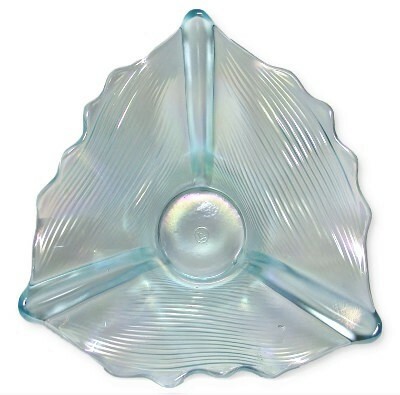 Ice blue 3 toe DRAPERY candy dish. Marked with Northwood's underlined capital N in a circle. Measures 7" X 4". There is one extremely tiny flea bite on one of the toes. No chips, cracks or repairs. 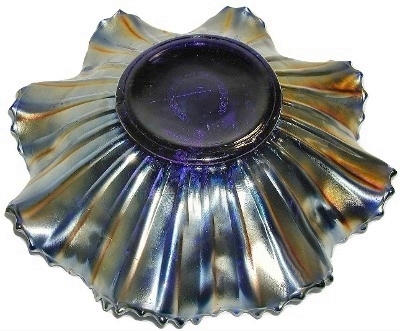 Brilliant purple DRAPERY 3 footed candy dish. Marked with NORTHWOOD'S underlined capital N in a circle. Measures 6 1/2" across and stands 4" high. One foot has the tiniest flea bite on the seam end. No other chips, cracks or repairs. 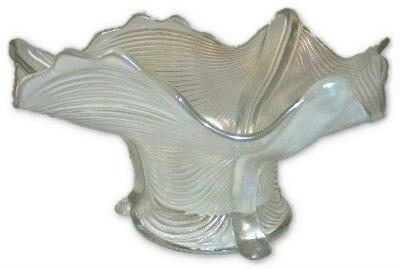 Frosty white 3 toe DRAPERY candy dish. 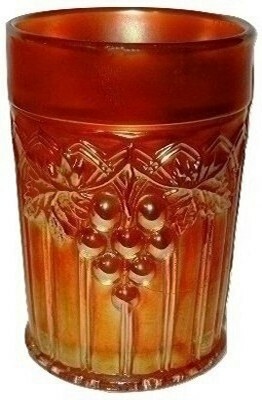 The vase has Northwood's underlined capital N in a circle mark. Measures 6 1/2" X 3 1/2". No chips, cracks or repairs. 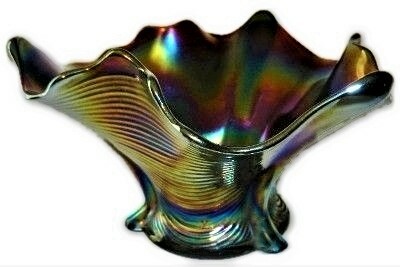 Aqua opalescent DRAPERY rose bowl. Measures 5 1/2" X 3 1/2". No chips, cracks or repairs. 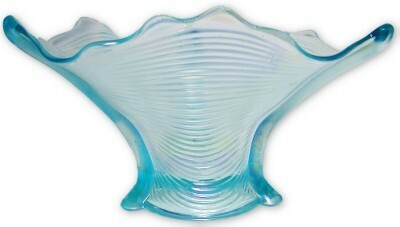 Aqua opalescent DRAPERY rose bowl. Measures 5 1/2" X 3 3/4". No chips, cracks or repairs. 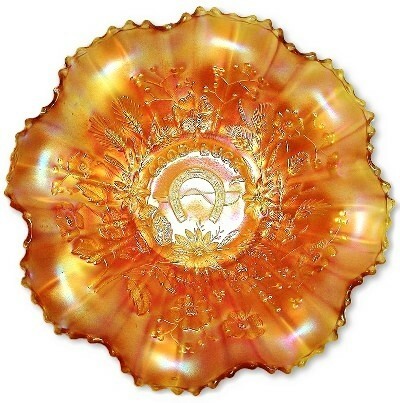 Northwood "Embroidered Mums" magnificent dark marigold ruffled bowl. Measures @ 9" X 2 1/2". 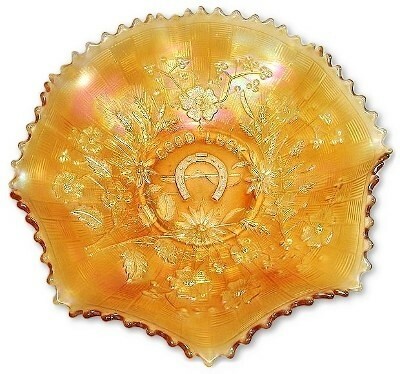 A slight rise to the center inside of the bowl from the manufacturing process and this is one of the finest marigold examples you could wish to own. No chips, cracks or repairs. 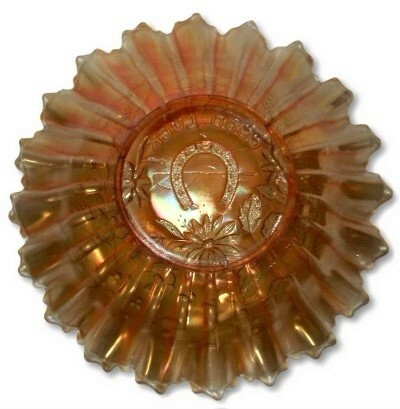 Northwood "Fine Cut and Roses" with "Fancy Interior" brilliant white three footed candy dish. 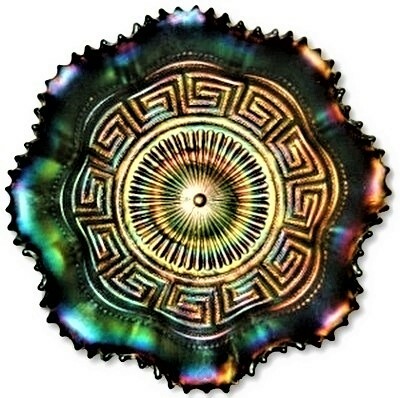 Measures 7" X 3 1/4". No chips, cracks or repairs. 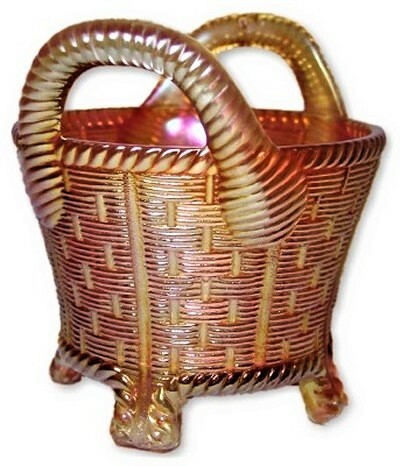 Lavender & Horehound Fruit and Flowers two handled bonbon with basket weave back pattern. 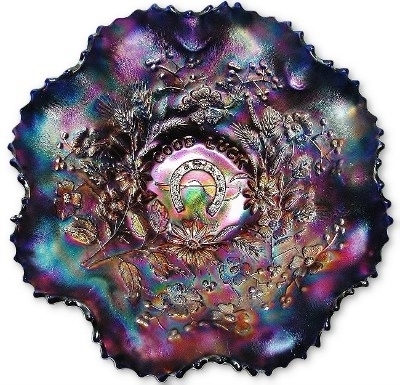 The item is covered in a soft and frosty pink iridescent finish. Measures 8" across from outside of handle to outside of handle and sits 4" high. No chips, cracks or repairs. 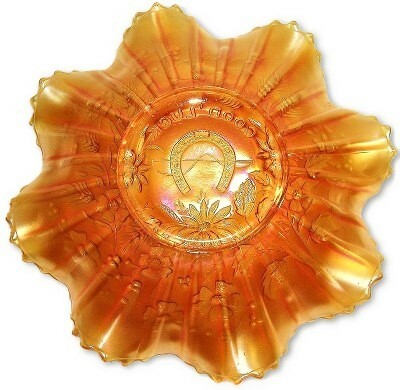 Marigold FRUITS & FLOWERS 2 handled pedestal bonbon. 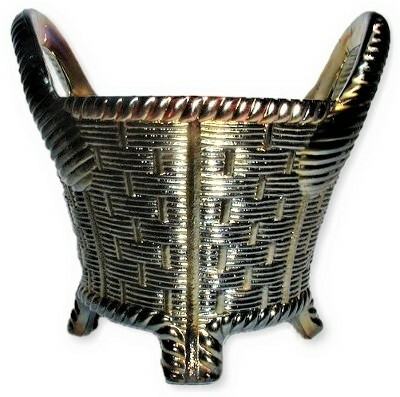 The reverse side pattern is basket weave. 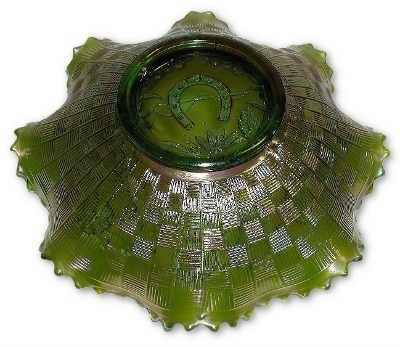 The interior of this item is marked with NORTHWOOD'S underlined capital N in a circle. One of the points has a small flat chip to it's side. No other chips, cracks or repairs. 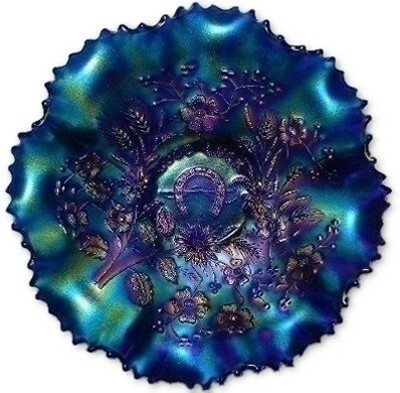 Electric blue pie crust edge Good Luck bowl. 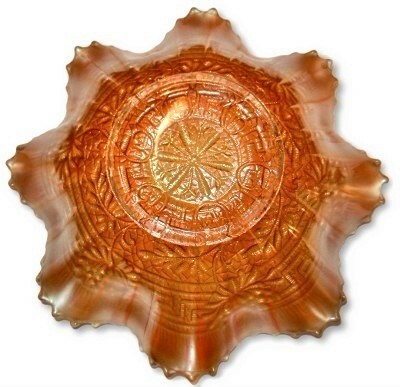 Measures 9" across and sits 2 1/4" high. 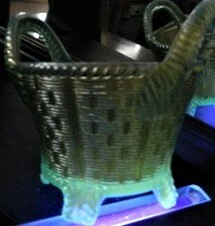 The color in the iridescent finish jumps off the surface and light up the room. Very minor stacking wear marks on the reverse side which also is the scarce rib back. No chips, cracks or repairs. 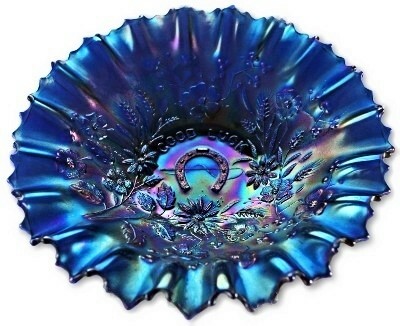 Electric blue ruffled Good Luck bowl. 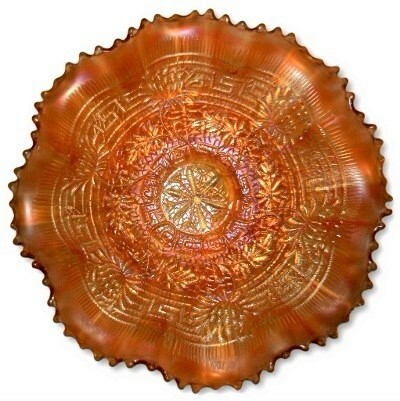 Measures 9" across and sits 2" high. 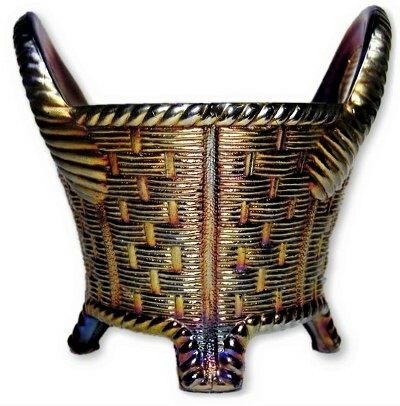 Has the scarce rib back pattern. No chips, cracks or repairs. 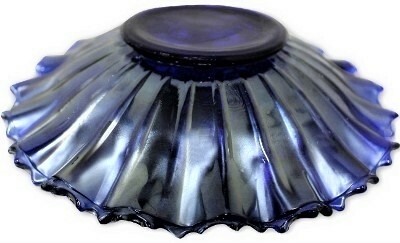 Dark electric blue Good Luck ruffled rib back bowl. 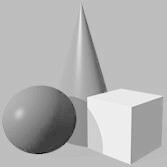 A sharp in the making point. 8 3/4" X 2 1/2". No chips, cracks or repairs. 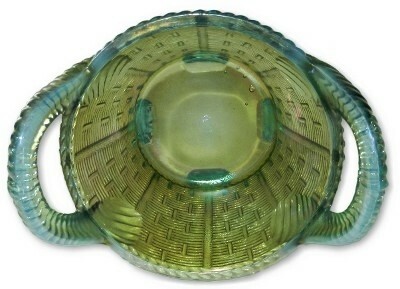 Apple green Northwood Good Luck with basket weave back pattern ruffled bowl. 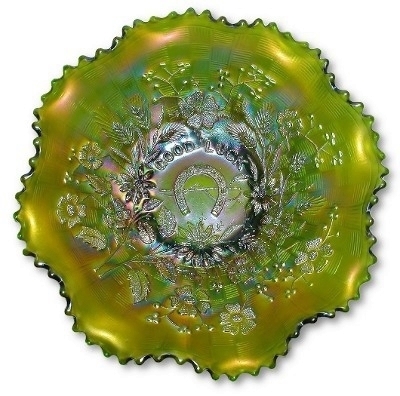 A stunning iridescent finish and great mold strike. 8 7/8" X 2 1/4". No chips, cracks or repairs. 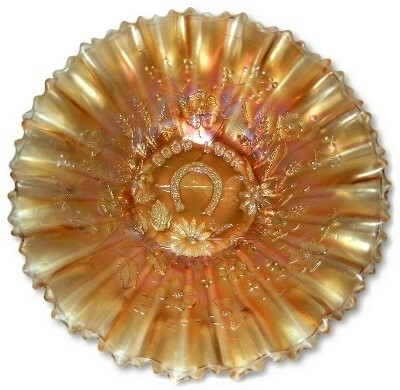 Marigold Good Luck ruffled bowl with ribbed back pattern. 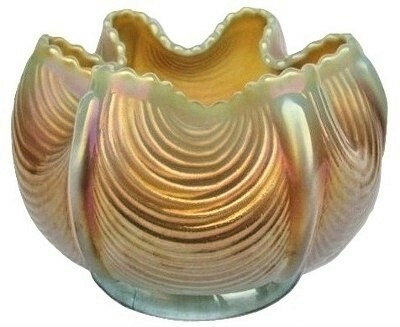 This item has an excellent mold strike and wonderful color and iridescence. Measuring 9" X 2 1/4". No chips, cracks or repairs. 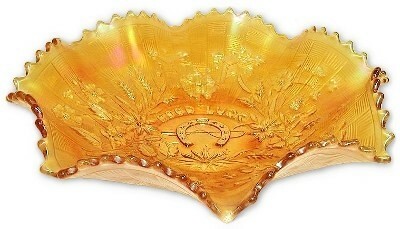 Pastel marigold Good Luck pie crust edge bowl with a ribbed back pattern. 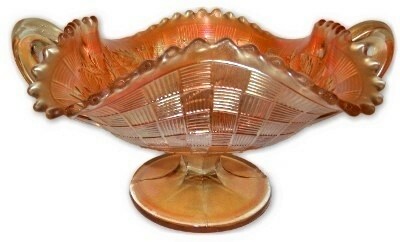 This item has an excellent mold strike and wonderful color and iridescence displaying much pink. Measuring 8 3/4" X 2 1/2". No chips, cracks or repairs. 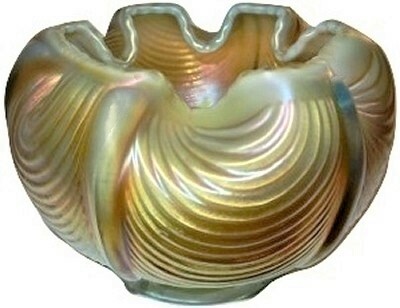 Pastel marigold Good Luck ruffled bowl. Marked on the bottom with Northwood's underlined capital N in a circle. 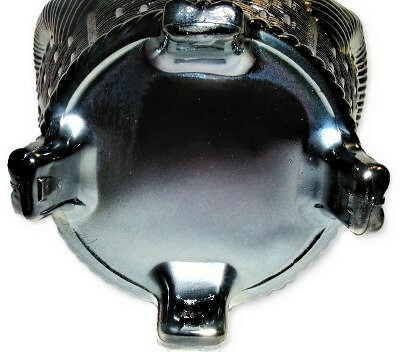 There is a small 1/4" collar base rim heat check. No chips, cracks or repairs. 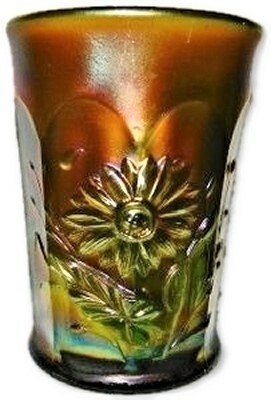 Pumpkin dark marigold "GRAPE & GOTHIC ARCHES" tumbler. Measuring 4" X 2 3/4". No chips, cracks or repairs. 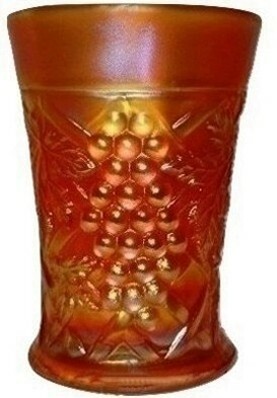 Dark marigold GRAPE ARBOR tumbler. Measuring 4 1/4" X 3 1/8". No chips, cracks or repairs. 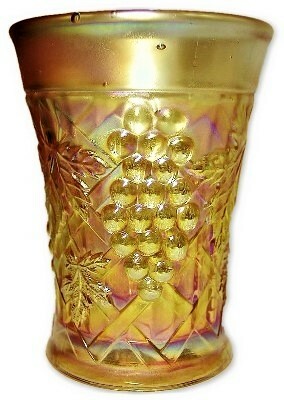 Marigold GRAPE ARBOR tumbler. 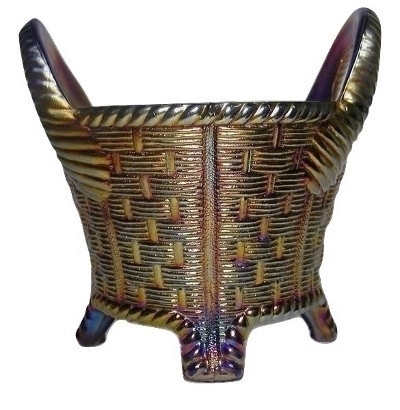 Has the ribbed interior pattern that is not commonly found. Measuring 4 1/4" X 3 1/8". No chips, cracks or repairs. 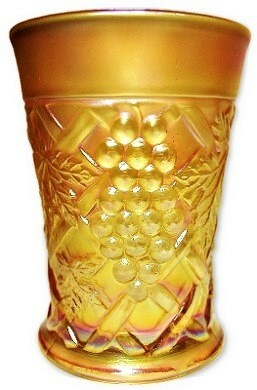 Marigold GRAPE ARBOR tumbler. Measuring 4 1/4" X 3 1/8". No chips, cracks or repairs. 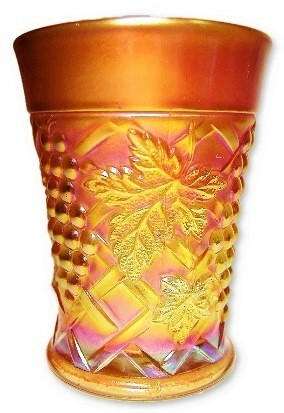 Pumpkin dark marigold GRAPE ARBOR tumbler. Measuring 4 1/4" X 3 1/8". No chips, cracks or repairs. 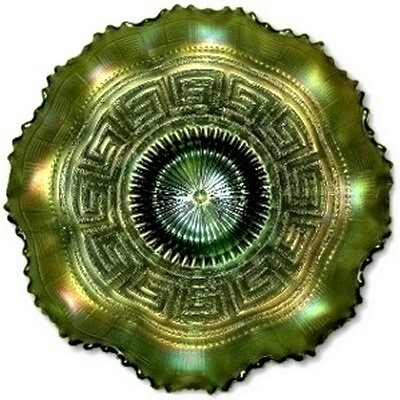 Green GREEK KEY with BASKET WEAVE back pattern. 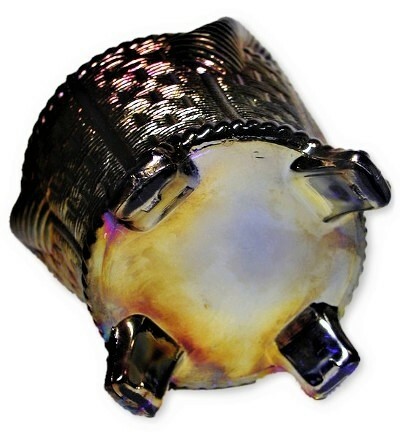 Has a myriad of tiny in the making bubbles which add to the individuality of this beautiful piece. Measures 8 1/2" X 2 3/4". No chips, cracks or repairs. 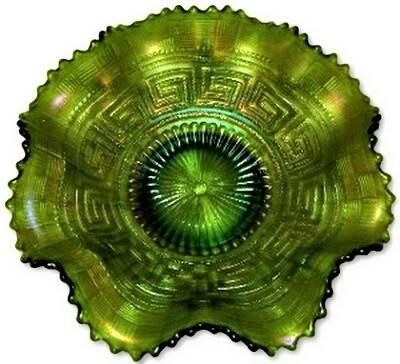 Green GREEK KEY with BASKET WEAVE back pattern. Two of the scalloped points were pulled to a little sharpness/pointed from the manufacturing process. Measures 8 1/2" X 2 3/4". No chips, cracks or repairs. 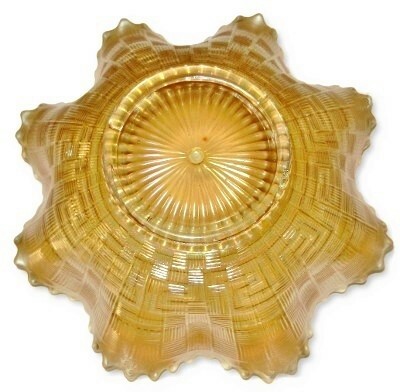 Pastel Marigold GREEK KEY with BASKET WEAVE back pattern ruffled bowl. 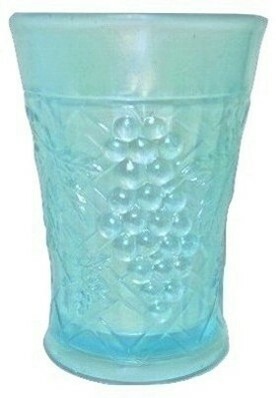 Measures 8 3/4" X 2 1/2". No chips, cracks or repairs. 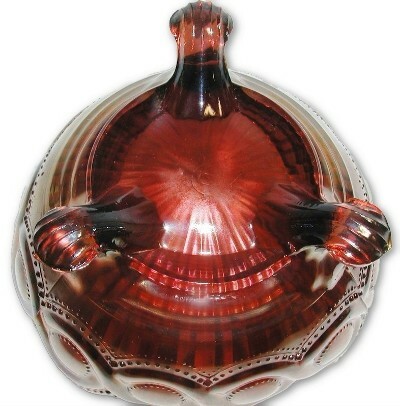 OXBLOOD GREEK KEY with BASKET WEAVE back pattern ruffled bowl. Measures 8 3/4" X 2 1/2". No chips, cracks or repairs.